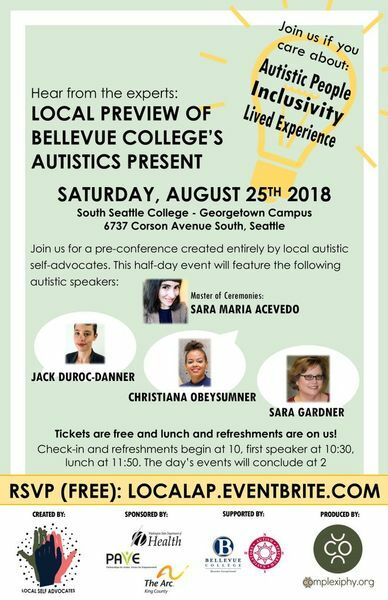 I attended Bellevue College’s Autistics Present pre-conference session at South Seattle College’s Georgetown campus on Saturday, August 25th. This pre-conference was created entirely by local autistic self-advocates. The first speaker, Sara M. Acevedo, PhD, is a recently-appointed faculty member at Bellevue College. Her opening remarks as Master of Ceremonies reflected on the social consciousness of solidarity, by reimagining solidarity through mutual aid and political companionship across marginalized groups. She believes that solidarity should be a verb of action instead of a state of being. Solidarity also encompasses unity of the intersections, across race, age, disability, gender identity, and religious affiliation. This is an uplifting message that needs to be shared, especially during these politically–divisive times. The second speaker, CrisTiana ObeySumner, spoke about intersectionality when an individual holds several disabilities. Intersectionality was defined as holding two or more socially-constructed identities. The social complexity of how people with autism react to nonverbal cues leads to implicit bias, which causes able individuals to hyperfocus on specific identities. They believe America is engaged in a civility war, where norms of politeness and respect take a back seat to politics and ideology. People need to be accomplices, not allies to ensure that all people are given an equal opportunity to survive and thrive in society. The third speaker, Jack Duroc-Danner, spoke about mythbusting nine commonly-held beliefs about autism. These myths include: “High functioning” vs. “low functioning”; autism as a linear spectrum disorder (its actually more like a color wheel); people with autism have zero empathy; no touching; autism afflicts boys and men only; 100% asexual; autism is new; autism is trendy; and autism is a cultural phenomenon. They provided data and research findings that support how many of these beliefs have no scientific basis. This pre–conference provided participants an opportunity to network with successful individuals diagnosed with autism, and I learned several new terms (intersectionality, civility war, and neurodiversity). 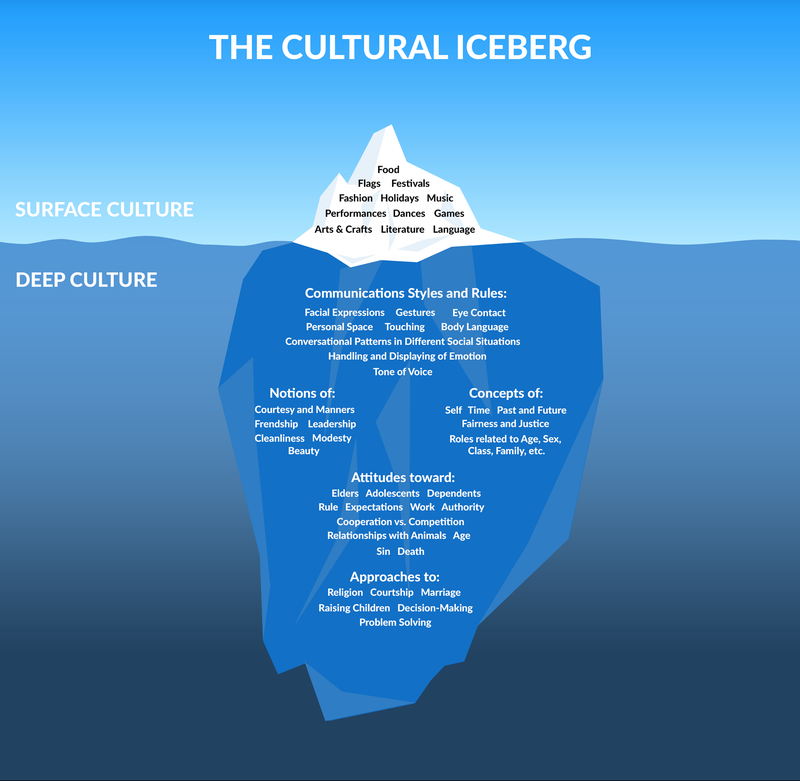 I also learned about Edward T. Hall’s “cultural iceberg” (https://rachelmarsdenwords.files.wordpress.com/2015/08/11807619_10153426923151291_1691980310425285378_o.png), where deep culture impacts the many social interactions that may lead to institutional bias if able people misinterpret autistics’ stimming behavior. I highly recommend that mental health providers and people with autism attend the 3rd Annual Autistics Present Symposium on October 20th at Bellevue College. For more information, go to: https://www.bellevuecollege.edu/autismspectrumnavigators/autism-conference/. The symposium’s theme is “Intersectionality: Claiming All Our Identities.” This pre–conference opened my eyes to the wide variety of strategies people with autism self-advocate for independence and respect today.